I have two kids: one a healthy, adventurous, vegetarian and the other a picky eating omnivore. I, myself, was a picky eater as a child. I used to think that picky eaters were a result of laxative parenting; however, my own children have taught me there is more to it than that. 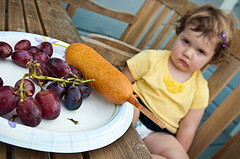 Allowing children to be picky eaters could make them more prone to allergies later in life, scientists have warned. Allowed to be picky eaters…scientists have never met my son. He is presented with the same wholesome foods as his sister, but he turns his nose up at new things. For instance, yesterday he wouldn’t even try the chocolate treats I made, and he loves chocolate. It is true that I do allow him to make other choices at dinner, perhaps not as healthy as those being served, but I don’t feel that picky eating is a personality disorder. The results of this new study suggesting “picky eating” leads to allergies is contrary to what I have always intuited. I believe we should listen to our bodies. If we avoid a food, like my son avoids nuts, then perhaps there are sensitivities we must honor. Turns out, the Guardian article is not so much about picky eating, as the headline implies, but it is about avoiding feeding your child highly allergic foods when they are young. Prof Gideon Lack, of King’s College, said that until recently mothers were told to breastfeed for up to six months before introducing their babies to other food, and keep them away from possible allergens until the age of two or three. The idea, he said, was to “wrap the infant up in a sort of immunological cocoon and not expose them to proteins that could launch allergic reactions. “There is a possibility that we were achieving the reverse of our intentions through this avoidance policy,” he told the Nature journal. But because studies into allergies have typically followed small groups over brief time periods, there is still no firm evidence over whether desensitising children to foods like peanuts is temporary or permanent. We waited until our children were over a year, and yes they were still breastfeeding, to try strawberries, dairy, soy, peanuts, and gluten. I would do it again, and it has nothing to do with picky eating. I agree with you. I think the scientists have it backwards and that kids who are picky eaters MIGHT have undiagnosed food allergies. Especially if they describe the food as painful in some way. I would often describe food as itchy. Some of it was food that is finger food and at first my parents thought it was the skin contact – but even if I used a fork and knife I would still complain that it was itchy. I have both contact and atopic dermatitis. At that time in my life it was so bad my parents wouldn’t have been able to say Kimberly ate X and got a rash – I was a rash from my shoulders to my feet – especially my hands and feet. After a couple of times were I STRONGLY objected to a food or more honestly pitched a total tantrum and they discovered later that it had peanut oil in it – my parents realized that when I said a food was itchy or earachey I should not eat it. I can smell stuff like peanut products from a good distance away. The “rule” in my extended family now is a) a kid has dermatitis they get tested for peanut allergy before they eat anything with peanuts. A child with atopic is more likely that the average child to be allergic to peanuts. (They can do the test by drawing blood and testing in the lab. Good thing since I went into full on anaphlaxis from the skin test to see how sensitive you are before they begin the real test.) b) if a child says a food is itchy, burns my throat, gives me a headache/earache or tastes sour (when it shouldn’t) they don’t eat it.